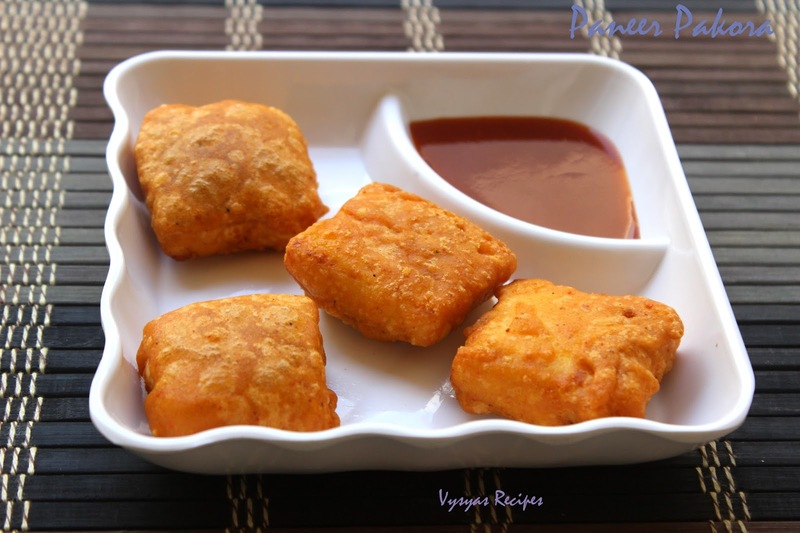 Paneer Pakora is a Popular & delicious Indian fritters. Paneer coated in a batter & deep fried makes crispy crunchy Golden shade . Pakora's,melts in mouth. 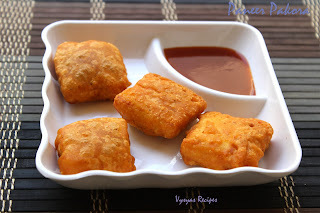 Crunchy outer crust & soft inside is a srumptious appetizer for Paneer lovers. 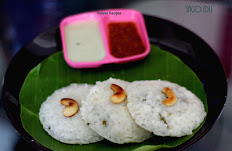 It is an apt snack for tea time & also during Rainy Season. Now we learn to make popular appetizer. Baking Soda - a Pinch (optional). Slice the paneer carefully using the knife into desired shapes, not too thin or too thick. 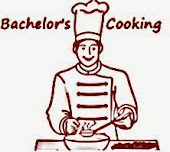 Take a Mixing bowl combine besan flour,Rice flour,chilli powder,cumin Powder,Garam Masala, Ginger garlic Paste, Baking Soda & salt. Mix well. Then add water little by little to make a thick batter without any lumps. Heat the oil in a pan or kadai for deep frying. 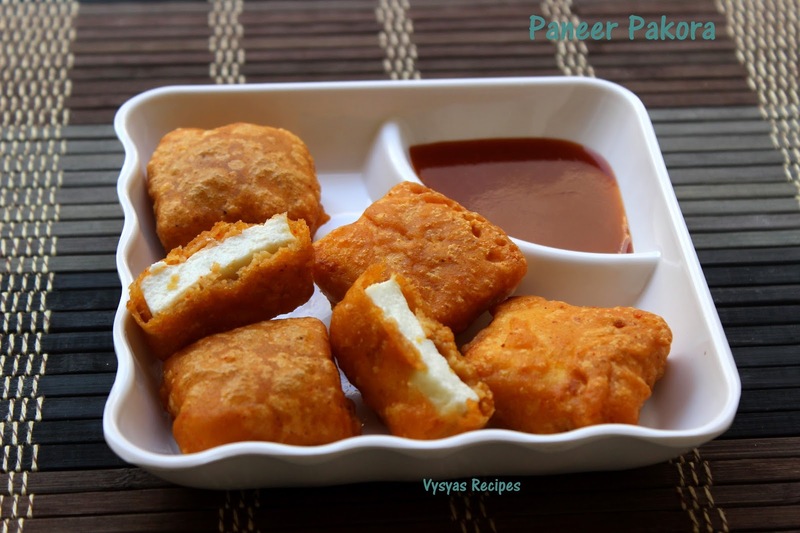 Dip the paneer slices in the batter & coat the slices in the batter. when the oil is hot,keep the flame to medium, drop the coated paneer slices. Deep fry the Paneer pakoras till it turns crisp & Golden. 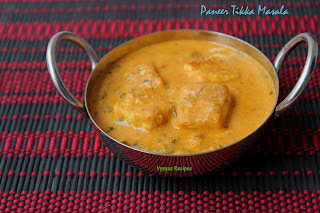 Drain the paneer pakoras in a Paper towel to remove excess oil. Serve the pakoras with Green chutney or tomato ketchup. 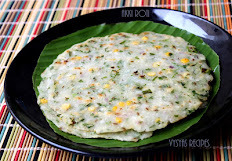 Batter should not be too thick or runny. 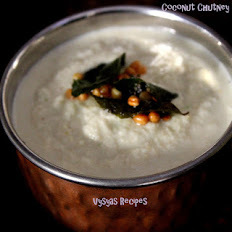 it is should be in moderate consistency, so that paneer coats well in batter. Adjust the chilli powder according to your taste. Slice the Paneer Gently & also not too thick or thin. Adding Ginger garlic paste enhances the flavour of pakoras. Very nice. Perfect tea time snack. 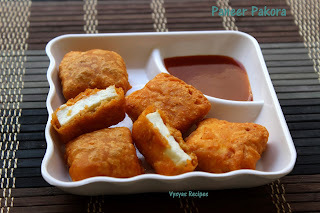 I love paneer pakora, you are making me hungry dear.